They may not be the height of fashion, but the green jacket Augusta National awards to the winner of the Masters tournament is one of sports’ most revered prizes. Here’s everything you need to know about the flashy garment. 1. The green jackets weren’t always trophies. Augusta National opened in 1933, and in 1937, members started wearing green jackets. Founder Clifford Roberts hoped that the conspicuous jackets would help members stand out as “reliable sources of information” for visitors and signal who should get the check at dinner. 2. Nobody wanted to wear those original green jackets. As the story goes, Roberts made a bulk order of heavy wool jackets from the Brooks Uniform Company of New York when he began the tradition. Members complained about the impractical choice for the warm Georgia spring, but all were too mindful of their manners to remove the stifling garment. 3. Today’s jackets are cooler. Practicality eventually prevailed on the temperature front. Modern jackets are a blend of tropical-weight wool and polyester. 4. The jackets are created in Cincinnati. Cincinnati clothier the Hamilton Tailoring Company has been crafting the standard green jackets since 1967. While the assembly is done in Cincinnati, the components of a green jacket come from all over the country. The wool blend originates at Victor Forstmann Inc. in Dublin, Ga. The custom brass buttons are made by Connecticut’s Waterbury Button Co., and the iconic breast-pocket patch is the handiwork of North Carolina’s A&B Emblem Co.
5. There’s also a more refined option. While the Hamilton jacket is entrenched in golf lore, champions and Augusta National members can also upgrade their green jacket. Since 1996, tailor Henry Poole of London’s famed Savile Row has been working with Augusta National to create bespoke, made-to-measure green blazers. In 2013 Simon Cundey, a director of Henry Poole, explained to Golf International that these high-end options use a high end pure wool crafted in West Yorkshire rather than the blend used in the American-made jackets. 6. Sam Snead was the first champion to get a jacket. Although the Masters began in 1934, the tradition of giving the champion his own green jacket didn’t take off until 1949 when Sam Snead donned the first champion’s jacket. The club then awarded retroactive jackets to all past champions. 7. The jacket the champion slips on isn’t the one he keeps. The defending champion helping the newly crowned winner into his green jacket is one of the Masters’ most iconic scenes. The winner won’t be keeping that jacket, though. 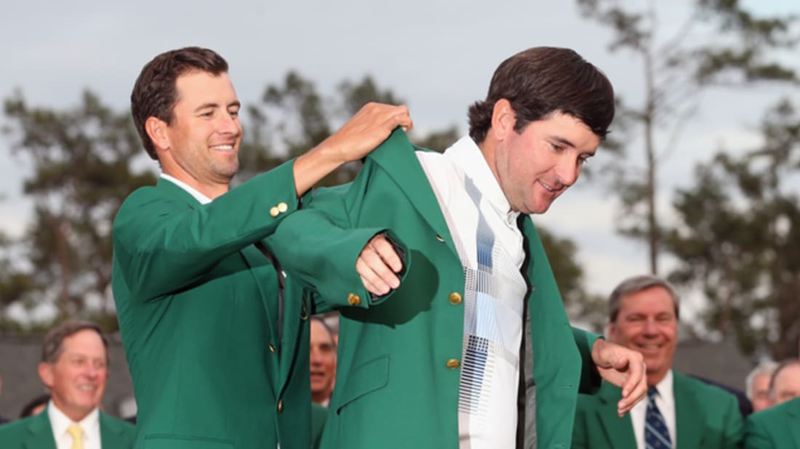 During Sunday’s final round Augusta National officials eyeball the top contenders’ sizes and gather similarly built members’ jackets that can be used in the ceremony. After the photo op, the member gets his jacket back, and the champion receives a custom jacket a few weeks later. 8. The champ can wear the green jacket anywhere he wants, but only for one year. Until the following year’s Masters, the defending champ can don the green jacket any time he leaves the house for an event or, in Phil Mickelson’s case, a Krispy Kreme run. After that year is over, he has to return the jacket to the club. It will be waiting for him each year when he returns for the Wednesday night Champions Dinner. 9. Gary Player ignored this rule. After Player won his first Masters in 1961, he took his green jacket home to South Africa. When he returned for the 1962 tournament, he forgot to bring the jacket with him. Once the club discovered this lapse, Clifford Roberts gave Player a call to ask him to return the jacket. Player has recalled the conversation with Roberts in interviews. “I said, ‘Well, you can come and fetch it.’” According to Player, Roberts saw the humor in the situation but implored him, “No, in all seriousness, please don’t ever wear it in public.” Player has since complied with the request. 10. It took Jack Nicklaus a long time to get his own jacket. When Nicklaus returned to Augusta to defend his title in 1964, he was surprised to find that the club hadn’t slipped a properly sized blazer into his locker. Always a cool customer, the Golden Bear improvised by borrowing the jacket of Thomas Dewey, the former governor of New York, Augusta member, and presidential candidate who’s best remembered for not defeating Harry Truman in 1948. Even after Nicklaus won the Masters in 1965 and 1966, no jacket appeared. Dewey’s jacket fit Nicklaus, and the legend kept borrowing it for the annual Champions Dinner. By 1972, Nicklaus realized he needed to stop borrowing Dewey’s jacket. Rather than raise a fuss, he asked Hart, Schaffner, & Marx, with whom he had a clothing deal, to create a green jacket for him. It wasn’t quite the perfect copy. “It wasn’t even the same material or the right color,” Nicklaus remembered in 1999. After a couple of years in this fake jacket, he reverted to quietly borrowing green jackets from members. Finally, in 1997 Nicklaus mentioned to Augusta’s chairman, Jackson Stephens, that he had never received a green jacket of his own. Stephens was initially incredulous, but after hearing Nicklaus’s story, he told the six-time champ to go get fitted for a much-delayed trophy. By this point, Nicklaus enjoyed regaling friends with the story of how he didn’t own a jacket and didn’t want to shake things up, but when he turned up for the 1998 Masters, he finally had his own green jacket. 11. They’re the holy grail of golf memorabilia. Augusta National is smart to keep the jackets on its grounds. Although the jackets are rumored to only cost around $250 to make, memorabilia collectors will pay big bucks for a chance to own golf’s most iconic offer. In 2013, relatives of Horton Smith, who won the tournament in 1934 and 1936, found his green jacket in a closet. They put the prized garment up for auction, where it fetched $682,229.45, a record price for golf memorabilia.